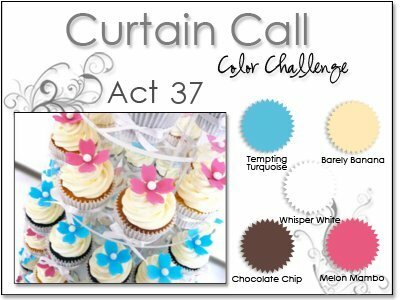 To celebrate Stacey Schafer’s birthday this week, the latest Curtain Call Challenge at Stacey’s Stamping Stage features these fun colors, inspired by these tasty-looking cupcakes from Hello Sugar! My husband’s birthday was a few weeks ago, but because he was away doing soldier-type things on his actual birthday, we didn’t get to celebrate until this weekend. I made him a German Chocolate cake (from scratch) using a recipe I found at the Betty Crocker web site. It’s a lot of work, but it’s delicious! I used SU cardstock in the challenge colors, and also Natural White. 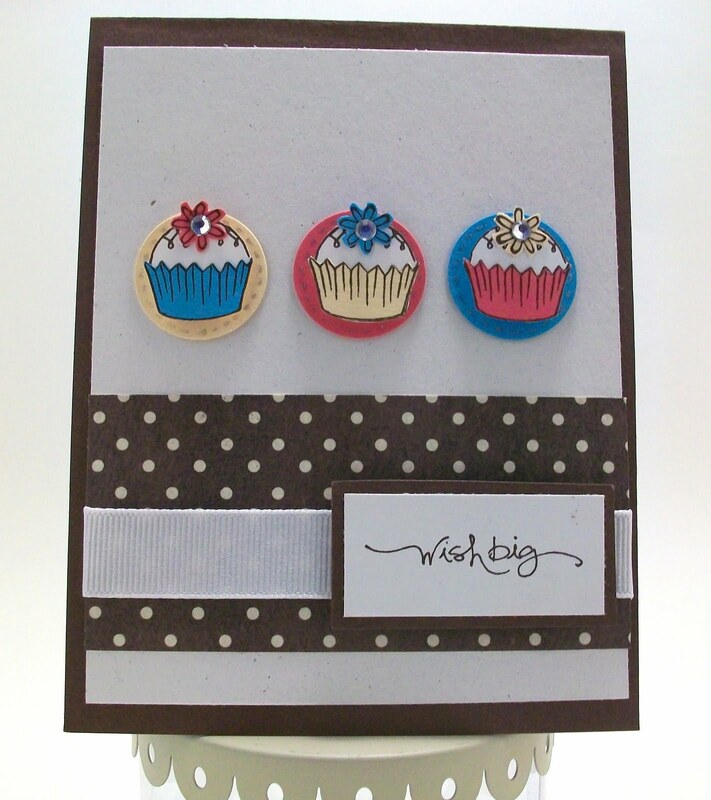 The cupcakes and sentiment are stamped with Chocolate Chip ink. The cupcake stamps are from Elzybells Art Stamps, and the sentiment (and flower stamp) comes from SU’s “Short & Sweet” stamp set. The polka-dot paper is from My Mind’s Eye. I added white grosgrain ribbon to the card, and glued rhinestones to each flower’s center. super cute, Suzanne! love the trio of cuppies:) thanks so much for playing along at the Curtain Call! How perfect is this? Great use of the inspiration photo and the colors. So sweet!